Measurement technology is increasingly being integrated in production processes. Functions such as the OnTheFly operating mode, wherein measurements can be performed with the image processing sensor while the machine axes are moving, allow high throughput. In the CT field machines with monoblock transmission target tubes can be used for rapid measurements at high accuracy. Similar to the image processing sensor, OnTheFly CT can increase measuring speed by up to ten times for some applications. Optical and tactile multisensor coordinate measuring machines will continue to dominate the area of production monitoring, as they are faster than CT machines when just a few dimensions need to be checked. Conventional probe systems that were around at the beginning of automation in metrology will never go away, as optical sensors cannot reach every element or capture every surface. For fast, flexible measurements, a combination of optical and tactile sensors is the solution. The advantages of CT over conventional coordinate measuring machines, though, lie in the complete capture of the work piece, enabling rapid first article inspection, for example, or efficient tool correction for plastic injection molding, thus accelerating product development. Because the measurement time is not affected by the number of dimensions, computed tomography is being used more frequently for production monitoring as well, mainly for work pieces with many inspection dimensions. Werth was still skeptical 25 years ago as to whether it would ever be possible to measure substantially more accurately than one micrometer. 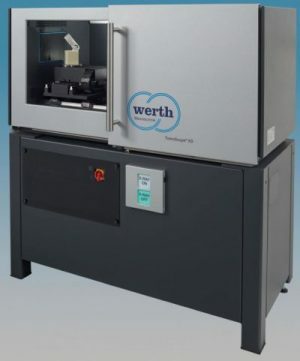 Today, improving accuracy still remains a development goal, and machines and sensors with measurement errors less than 100 nm are in development at Werth.